The history of Passiflora or ‘Passion flower’ (Flos passionis) is fascinating and unique. It acquired its name from descriptions of its flower parts supplied in the Seventeenth Century by Spanish priests in South America, known at that time as the ‘New Spain’. It was known by the Spanish as “La Flor de las cinco Llagas” or the ‘The Flower With The Five Wounds.’ ‘Passionis’ refers to (Christ’s) suffering. The parts were interpreted from drawings and dried plants by Giacomo Bosio, a churchman and historian, in Rome (1609), as representing various elements of the Crucifixion. Blaue passionsblume, calalagranadiglia, Çarkıfelek Çiçeği, chinola, fior ‘d pasiòn, fiore della passione, fleur de la passion, flor de la passió, flôr di passion, granadilla, grenadilla, grenadilo, guavadilla, Isusova kruna (Jesus crown), konyal, lilikoi, maracuja, maracujá, maracuyá, markisa, Mburucuyá (a town in Corrientes Province, Argentina. the original Guaraní name from which all similar names originated), mburukuja, mučenka, parcha, parchita, pasiflora, pasifloro, passiflora azzurra, passiflore, passiflore bleue, passionaria, passionera, passion flowers, passionsblomma, گل ساعت, and sweet cup! The five petals and five sepals are the ten disciples less Judas & Peter. The corona filaments are the crown of thorns. The five stamen with anthers match the five sacred wounds & the three stigma the nails. This symbolism is not universal however, in Japan it is sometimes known as ‘The Clock-faced Plant’ and apparently has recently been adopted as as symbol for homosexual Japanese youths. Passion fruit have been grown as a semi-domesticated crop by the Aztecs, Incas & other South American Native Indians for thousands of years. See also Gremillion, K. J. (1989). The development of a mutualistic relationship between humans and maypops (Passiflora incarnata L.) in the southeastern USA. Journal Of Ethnobiology 9(2): 135-155. Passiflora were widely introduced to Europe from South America in the Eighteenth Century, principally by the Spanish, & can now be found in many parts of the world including Africa, Asia, Australia & North America. 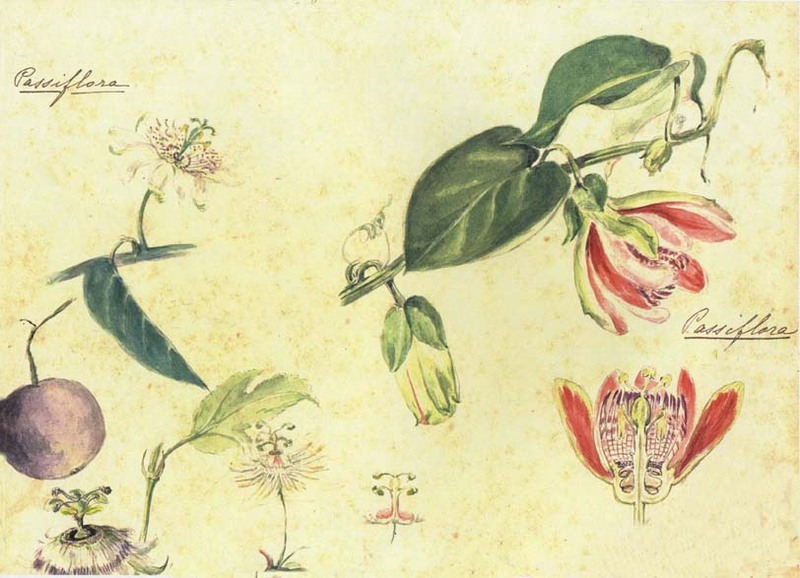 Passiflora were first classified by Linnaeus in 1745 when he recognised 22 species. There are now thought to be over 600, but many are under threat in their natural rainforest habitat. Hybrids were first produced in UK in the 1820’s – the first one, P. x violacea, although its correct name is disputed, is still with us. Popular with the Victorians in UK, Passiflora became less fashionable in the early Twentieth Century, but now there is worldwide interest in them both as a commercial crop with new varieties being introduced & as an exotic decorative addition to gardens, conservatories & greenhouses. In addition P. incarnata is used by herbalists as a mild sedative & there may be further medicinal uses of other species.